Cadillac is in the midst of yet another revival. For real, this time. Honestly. Cadillac may never have been a noteworthy brand to Europeans on the basis of sales figures on the old continent. But that hasn’t prevented the erstwhile Standard Of The World from gaining fame (and some notoriety) on this side of the Atlantic, on the simple basis that Cadillac is one of the most storied, evocative brands of all time, anywhere. If a full-size pick-up truck is as American as apple pie, a Cadillac is as reminiscent of its home country as a one of those huge, elaborate barbecue grilles that cost more than some basic cars. However, as with some other legendary names (Jaguar, Citroën, to say nothing of poor Saab), the performance of the Cadillac brand over the past decades has hardly been in keeping with the name’s lustre. There have been so many attempts at relaunching the marque on a global scale over the past three decades that keeping track would prove a challenge to anyone but the most ardent of Cadillac enthusiasts. Models like the Seville STS or CTS were, to varying degrees, aimed at lending Detroit’s finest car brand a whiff of European flair, but ultimately failed to have much of an impact – unlike the gargantuan Escalade SUV, which is the main reason for the entire brand’s survival to this day. It would be utterly unfair to taint the Cadillac brand – and its designers in particular – by focusing entirely on the less successful aspects of the marque’s performance though. As recently discussed here, sublime concept cars like the Elmiraj or Sixteen proved what GM’s designers could achieve under ideal circumstances. But ideal, one may assume, the circumstances weren’t even during Cadillac’s most recent supposed resurgence. 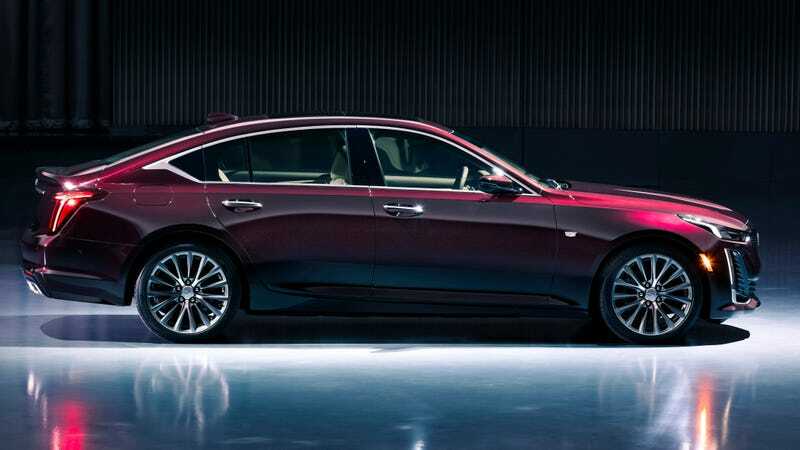 Despite moving the brand’s headquarters from decrepit Detroit to illustrious New York City, and the high-profile hiring of a new boss in (former Infiniti & Audi USA chief) Johan de Nysschen, the first fruit of this concerted effort give little reason to be cheerful. Being somewhat late to the ‘premium’ party, one would’ve expected Cadillac to bring something interesting along. Regrettably, the awkward light graphics are about the only remotely original aspect of the new CT5, XT4 & XT6 models. These apart, the large XT6 SUV appears like a ham-fistedly customised Volvo XC90, just as the smaller XT4 evokes a somewhat butchered Kia Sportage. Only the CT5 saloon can boast a bit of charisma, thanks to its peculiar fastback greenhouse (which appears strangely reminiscent of the Chevrolet Cruze). That being said, it still features the same bland grille treatment and generic surfacing as the other new Cadillacs. Now, in order to put these new cars into context, one ought to stress that these are not hair-raisingly inept pieces of design. But when looking at the great brand-building-through-design success stories of the past few decades (Kia, Audi, currently Volvo & Mazda), these Cadillacs fall well short of being convincing. As always, the design deficits stand for other issues, in certain cases even encapsulating them. The nomenclature, for example, highlights how some manufacturers are still besotted with going about things ‘the German way’. Why else would monickers as generic as XT4 or CT5 be employed, rather than those grandiose model names of yore (Eldorado, Fleetwood) or even a modernised take on these (Elmiraj)? Alphanumerics alone do not a ‘premium’ brand make – as Infiniti (Johan de Nysschen’s previous domain) had also had to find out eventually. Clearly, nobody would seriously suggest that Cadillac should turn back time by 40 years and start building six-metres-long, befinned convertibles again. But a bit more self-esteem, a bit more belief in one’s own heritage and, above all, trust in the talents of one’s design team would go along way. Modern-day Americana may not constitute the aesthetic Standard Of The World anymore, but an ultimately rather bland blend of international styling cues is certainly less desirable a form than a distinct style that might alienate some, but equally charm others. For no matter how the automotive landscape will be reshaped over these coming years, regardless of what happens to the concept of ‘premium’ or what the future holds in store for the American manufacturers in particular: Timid mediocrity is the safest path towards oblivion. The thing was, that even though the older cars looked quite different from the new cars they were still valued and respected as worthy automobiles. The new models carried some minor stylistic themes from the past, but it was the same brash confidence displayed by all the cars that made them attractive. That essential “Cadillac-ness” was clearly evident to any American on looker. I have owned (as used cars) many notable models. A 1956 Sedan de Ville hardtop. This displayed the kicked up tail lamp fin theme that started in 1948 and ran through 1956. A 1957 Sedan de Ville hardtop that started the raised metal fin design that lasted until 1964. I also had a ’64 convertible. Later I had a 1970 Coupe de Ville that boasted the “blade fender” design that replaced the actual fin, This ran from the 1965 models pretty much to the end of the 1990s. The down sized 1977 model Coupe de Ville was purchased by me in 1979, my dream car. My final Cadillac was a 1994 NorthStar equipped Seville STS. So, I’ve had a few, and I loved them all. Unfortunately Cadillac lost their way in the 1980s and GM squandered the all the mystique, good faith and customer loyalty that had been built since the early 1900s. As stated in the article, Cadillac lost all it’s self confidence (many very poor corporate decisions had their part) and found that it’s territory was taken over by Lexus. Lexus built the kinds of cars that Cadillac used to. Cadillac has to stop chasing the Germans and just build good quality, competent cars. These Cadillacs will no longer compete directly with the World’s best marques but should be the best cars that GM can bring to the market. Isn’t building a Cadillac with European flair a contracition in itself? Cadillac is so quintessentially American that in being less American it simply would be no longer itself. Building a Euro-style Cadillac would be building Cadillacs for people that wouldn’t buy one anyway. Is not China now the mass-market for Cadillac? No one in Europe wants a car from America built for the chinese market. Are we to assume that the old ‘art & science’ design ethos that last two decades is now over? This is a shame, because for all its faults Cadillac’s sedans had a fairly clean and distinctive aesthetic. These new models look messy and confusing. I really cannot ‘read’ the CT5… what on Earth is it supposed to be? And is that C pillar detail aft of the rear door really a plastic blanking plate? From their vantage point in Manhattan, Cadillac’s management team will have noticed that the Escalade found favour in NYC as an executive taxi. This tells you a lot about America, but should also have rung alarm bells… because even in America, running a 6m long truck as a metropolitan private hire vehicle will eventually be exposed as a ludicrous proposition. Maybe this (and the dismal failure of models like the ATS) is the reason for this change in strategy. Hi Jacomo. So true about Art and Science, from which was created some genuinely handsome and distinctive vehicles. Such a shame they didn’t work in Europe, for whatever reason. If Cadillac has no further use for it, then perhaps one of the German premium trio might adopt it? All are desperately in need of a new design theme in order to restore some desirability to their ranges. As to the CT5, yes, that does really look like a gloss black plastic blanking plate in the C-pillar, just like the one on the Insignia, but worse because the Infiniti-like bright trim profile draws more attention to it. Yuk! Daniel, I think this is more about USA (and maybe China). Europe must feature very low on their list of concerns at the moment, because Cadillac is in deep trouble. Similar to Jaguar with the XE and XF, Cadillac’s enormous investment in a new generation of sports sedans has not paid off. It is a tragedy really because it feels like they have the right weapons but turned up to the wrong war… had these cars made in to market a decade earlier, I think they would have proved very successful. Jaguar XE, Cadillac ATS, Alfa Romeo Giulia… all three companies finally responded to the demands of enthusiasts and delivered highly polished compact luxury sedans, but the market had already moved on. They were just too late. When I had to unexpectedly replace my car two years ago the XE and Giulia were on my short list with the XE as my favourite because its lack of unnecessary creases and bulges in its bodywork. In the end, the XE’s shoddy build quality, nasty materials and general lack of attenation to detail ruled it out. The Giulia looked much better but re-visiting the nightmare of my former dealer made me feel physically sick and the mere thought of having to visit this place of torture and disinterest ruled out the Alfa. I’m sure I’m not the only one not buying these cars for these reasons. The new CT5 is a lumpen assemblage and amalgam of old Aeroback Olds Cutlasses, Chevy Citations and the current Honda Accord with added height and six inches sliced off front and back in an abrupt way. Who will actually buy one is the interesting question. Probably someone in need of an eye test and more money than sense. It really is the most awkward-looking pudgy blight on the landscape. A ’49 Pontiac torpedo-back owner would be in paroxysms of delight though – a spaceship version of his old bus is now available. Cadillac design wandering around in a daze has been the subject of comments on US car website forums for a decade, and nobody has come to a solid conclusion as to what the way forward should be. Whatever it is, after everyone had seen the new CT5, the consensus was – this isn’t the answer. Cadillac’s crossovers and single real SUV are merely regular GM vehicles with next higher grade interior materials, different infotainment and some version of the Cadillac front styling. Assembly quality is no better, but prices are high. Just more GM management delusion that the mere name means quality, when the reality is average at best. Still , you can fool some of the people some of the time, so the brand struggles on barely keeping its head above water. They sell a fair few in China so that helps to stoke the fires of indecision back in Detroit as to what to do next. Frankly, this has been true for a lot longer than people think. Cadillac was just more successful hiding it in the past. It goes way back. For example, the 1959 Cadillac is often selected as the most extreme and unique design of the brand. Look closely at the doors and door rings compared to the 1959 Buick. Yep, they are the same. Angel, Few of us are old enough to remember 1959 but I do recall the body on frame era of American cars. It was understood at that time that all the GM “motor divisions” used bodies made by the Fisher Body division. But there was enough differentiation, both mechanically and stylistically for all five of the car divisions to thrive. The other two of the Detroit three also used shared door skins and other visible parts among various brands at various price points at times during the 1950s. The downfall of American brands didn’t happen until decades later. So while it is easy to notice body parts which were shared or indistinguishable, it doesn’t even start to explain why, as Detroit was losing market share during the 1970s, VAG began to thrive by selling badge engineered Audis as VWs, specifically the Polo and Passat. The Audi 50 didn’t sell too well, but the first 80 was a worldwide hit as the Audi brand began to ascend. It is said that the Peugeot 504 and 604 shared door skins? Those two look very different to me, and the 604 was at least successful in France. Pininfarina in the ’70s was brilliant, and I think the same of GM design during the ’50s and ’60s. Clearly blatant parts sharing does not preclude good design. Ten years later, we might have noticed the Fiat Croma and Lancia Thema used the exact same door skins, and the Saab 9000 appeared to use them as well. But I think we can agree that those three car models were respected successes for their respective makers, blame Giugiaro, and the worthy engineers at Saab and Lancia, although my personal favorite Tipo 4 skin was by Pininfarina and shares no visible parts with the other three. Nowadays VAG is still at it, the first Cayenne looked like a poorly customized Toureg. Were the door handles different? They look mostly the same to me. But it clearly wasn’t a Toureg, and it was a sales success. Looking back at the GM ’59s through this lens, I think that the visual distinctiveness they were able to achieve considering what was required to be shared is remarkable. Conversely we see Cadillac flailing today, despite most models being quite different from Buicks and Chevrolets. I’ll agree that badge engineering hasn’t exactly helped Cadillac in the long run, lowlights include the notorious Cimmaron, the mediocre Catera and the pointless BLS. Yet ironically, the most successful Cadillac now is the one that shares most of it’s body panels with a Chevy truck. Cadillac´s case kills me. They are really throwing the basin at the their product line and still nobody likes them, they just like the the truck with the Cadillac badge on it. I know the cars aren´t perfect . They are a very long way from being bad too. I think the Lancia Thema shared no exterior panels but looked like it it did. Which made it all the more senseless. They could differ because each marque had its own pressings so when you make a new set of tools you might as well factor in some variation if it helps. The horrid C-pillar decoration resembles Infiniti’s, and de Nysschen was fired. This article from a year ago speculates on why his tenure was so short, but cannot draw any definitive conclusions. Perhaps now we can clearly see why. … tenure was -cut- so short. He was at Cadillac for four years, this car was developed under him, hopefully they can right the ship before it sinks.